The main thing we’re experimenting with is a silvopastoral hazelnut orchard. First let me explain what that is, and then why it’s experimental. Silvopastoralism, also called agroforestry, is where you mix livestock with tree crops with the goal of having them benefit each other. In our case, we’re running chickens and sheep in a field of young hazelnut trees. We get meat and eggs from the chickens, and we could get wool, meat, or milk from the sheep (more about that in a second). The sheep keep the grass and weeds from competing with the young trees, and the chickens finish it off while possibly eating insects that could act as pests for both the sheep and the hazelnuts. At the same time, both animals are fertilizing the trees and saving us time and money on mowing costs. 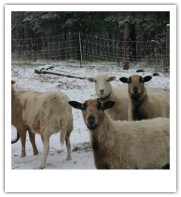 We don’t have any experience with keeping livestock, so we decided on Katahdin sheep, since they don’t need to be sheared and are supposed to be very hardy. If sheep end up working for us, we might explore other breeds for milk, wool, or meat production. It all sounds like a great idea, but will it actually work? “So far so good” is the only answer we have right now. The main potential problem is that sheep would likely eat our trees themselves. We got around this by putting them in a portable electric net. This allows us to rotate them around the orchard, but we also use it to protect the hazelnut trees. Because the net is electric, the sheep can’t stand on it or reach over to get at the leaves. But this creates a second potential problem: you have to make the electric fence into a fairly narrow paddock that basically curves along an alley between the trees. Sheep are easily frightened and don’t like feeling confined in small spaces. So we really didn’t know whether or not they would work with the grazing-alley set up we wanted -- at least not until a few weeks go, when we tried it. It worked great. Now we have to add the chickens into the mix. This means creating a mobile chicken coop, getting the chickens to learn to avoid the electric fence, and seeing if the sheep and the chickens can graze together in a narrow space. I’m not sure if that’s going to work out, so we’re taking it one step at a time, but the hardest part of this plan is probably over.